For newly-weds, finding a space could be hard if you are saving your budget for future needs. Building a new home could take a long time before actually happening so you might want to go for something more affordable like small room rentals and apartments. Read your newspaper in the classified ads section and look for places where you could rent a new home to start your new life together. How to share a closet with your husband? Before you begin to organize, discuss with your partner about both of your needs. It is vital to determine what you each want and need. Do you want a bigger clothing storage? Do you need to get out of bed and get dressed quickly? You need to also consider your storage needs. Utilize your closet space use hanging double bars and vertical shelves over the bars. The floor and lower shelves are best for women since they are much shorter. Guys are taller and can reach up to the upper shelves over the double bars. Schedule time to organize closet together. If only one of you manages and organize your closet space, the other might become unhappy and unsatisfied of the setup which results to a waste of time and effort. Do organize your closet TOGETHER. 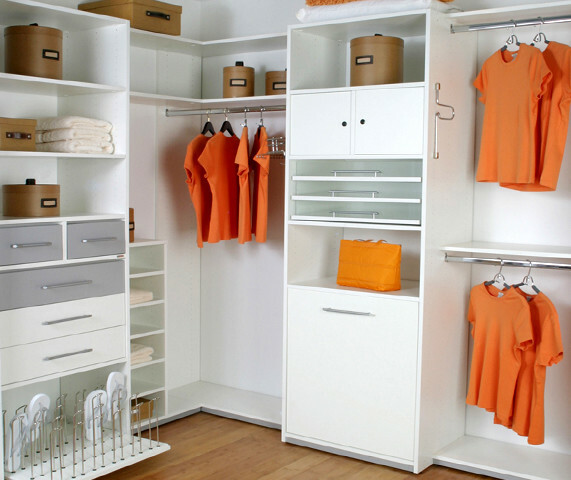 Talk with your partner when is the most convenient time to plan and organize closet space. Respect each other's choice of space. Although one of you might have a larger st of collection than the other, do not just cram it all in an open space within his territory. You must respect each other's spaces. Unless you have gone through this in tip 1, leave that open space for your other half. If there are no other spaces in your side to cram your things into, then take out the things you don't always wear and stack them in a bag or any storage item. That simple action reminds us that although we have a larger collection of clothes, we still have each of our space to ourselves and we need to have respect with each other. Label your own storage boxes each accordingly. The "Shoes" label could mean it's either yours or your partner. Be specific. Label boxes with your name like: "Angela's shoes" or something like that. You need to keep your clothes within your side of space. You don't want to spend the whole morning looking for your sweats in your hubby's area. By putting all your clothes in your own area, you will save your time looking for something to get on. Also, you're respecting your hubby's space area.